Eliminate Anxiety using EFT, NLP, and Hypnosis. Have you ever had anxious feelings that become too big and disproportionate to an event? Or panicky feelings that come upon you for no apparent reason? Have these feelings become frequent or do they include include excessive worrying, panic attacks, sleep problems? If you’re experiencing anxiety, you might notice irrational fears (including phobias), constant muscle tension, ongoing indigestion, flashbacks, compulsive behaviours, perfectionism, panic attacks, rapid heart beat, sweaty palms, difficulty breathing or self doubt. This isn’t ‘normal’. It’s like a gigantic, uncontrollable fear. It can be about nothing, for seemingly irrational reasons, about something that’s happened in the past and is over or about something that’s going to happen. Some anxious feeling can be normal in our day to day routines But when it happens too regularly or is disproportionate to events it’s extremely uncomfortable and scary. A little nervousness is normal in many situations. Nervousness and excitement are very similar, neurologically. But if you want to calm your anxious feelings, and enjoy excitement without rapid heartbeat, difficulty breathing, sweaty palms, and fear, you’ll find that EFT, Hypnosis, NLP, Regression Therapy, and Time Line Therapy are all excellent techniques with a track record of success. You can alleviate your anxiety. All of these therapies are available from Anne and can be experienced in her office in Victoria BC, or from your own location. With the use of technologies like Skype and Google Hangouts, Anne can work with you no matter where you live, bringing you peace and calm. Whether you’re experiencing Anxiety, Depression, PTSD, Abuse, Phobias, Emotional Eating or are Overweight, Anne can help you make the changes you want, in person or online. 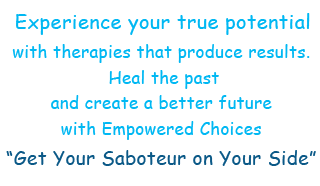 Change negative emotions, limiting beliefs, and unwanted habits using EFT, NLP, and Hypnosis with a compassionate and experienced Counsellor. Get Your Saboteur On Your Side. Call now for your free 30 min consultation – I look forward to hearing from you! "The intention behind every behavior is positive." I have worked with Anne for just over a year. Without a doubt, there has been a profound transformation in my emotional well-being since my first visit. Anne is so compasionate, warm, and good at what she does.... It is a huge gift to have worked with Anne and my life is all the better for it. Anne was able to track down my issues using her counselling and listening skills in the very first session. She is a skilled professional who produces results very quickly. I felt totally comfortable with her and as a result I was able to find relief. During one session with [Anne] my migraine headaches have completely disappeared. I’m not even sure what happened, but whatever it was, thanks!